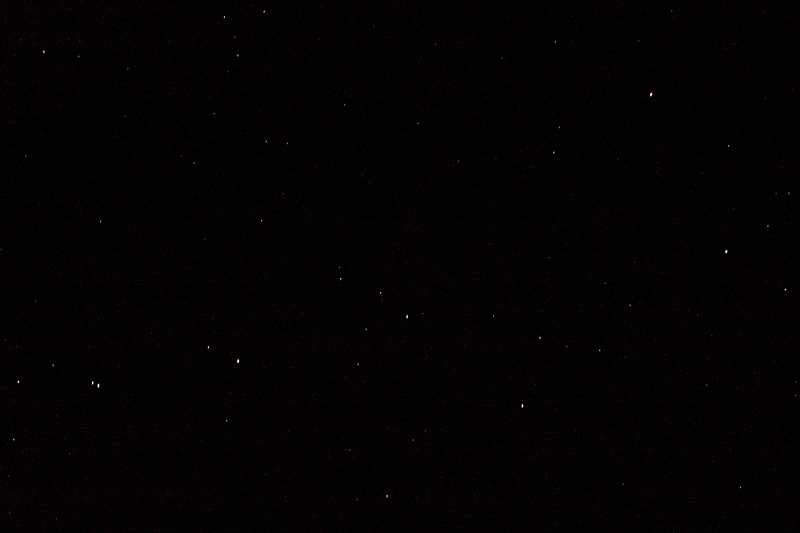 The Big Dipper was my main focus with some hopeful shots into the dark nothingness. I also tried (and failed) to get the moon and stars in the same shot. I’d really appreciate suggestions or techniques. I think it’s an issue of how to deal with the two different light values in the same shot… is it even possible? Is it only through stacking shots of varying time values that high quality can be achieved? I worry that by trying to correct the sky color you lose the depth of color in the image. As in, I don’t know if the Big Dipper stands out enough. Tonight wasn’t the only clear night we’ve had lately. In fact there was a time not too long ago I managed to get some decent shots of Orion. I don’t know which I like more. What aspects of each shot appeal to you? In the left shot, the tree in the bottom corner along with that odd J-shaped smear of a star (or planet? It’s pretty bright afterall) bothers me, but not enough to crop it out. In the image on the right, I feel the stars and the Orion nebula are more visible and bright, however the image is also ‘noisier’ in my opinion. I like both, but neither steals the show. I guess that’s how I feel about my photography in general lately. Oh well.